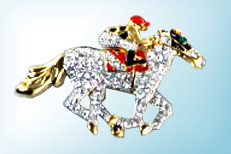 The Finishing Touch of Kentucky produces jewelry designs that consistently connect with horse enthusiasts of all types. 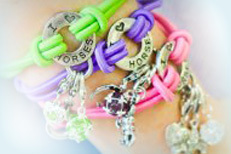 What better way to celebrate your love of horses than with jewelry! For over twenty years, The Finishing Touch of Kentucky has supplied tack shops, gift shops and retailers with unique designs that are American made and produce stable revenue. Enjoy exploring our site. Call us with a question or place an order. Let your grace and dignity shine! 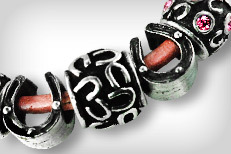 The Barbary Jewelry brand, owned by The Finishing Touch of Kentucky, is a line of clip-on charms which are used with link bracelets and necklaces, as well as adjustable bungee elastic carrier bracelets. The line also includes adjustable elastic bungee bracelets designed with a variety of popular motifs; the major theme of the line is equestrian. The Joppa Jewelry brand, owned by the Finishing Touch of Kentucky, is a line of large-hole European beads and charms used on earrings, necklaces, and bracelets. These are designed using smooth leather, braided leather, and snake chain. The theme of the line is fashion and equestrian. From brooches and cuff links to stock pins and gift sets, this line has you covered with elegance. Browse individual pieces, gift sets, and more. 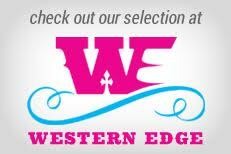 Western Edge Jewelry designs creations that release your inner beauty for the world to see. From earrings and bracelets to necklaces and much more, Western Edge reveals your beauty and strength whether you are getting ready for a special evening or looking forward to a girls’ night out.